With over twelve years of experience playing guitar, Mitch is skilled in the genres of jazz, funk, R&B, reggae, rock, and much more. He has studied classical and jazz harmony/theory, composition, and jazz guitar. 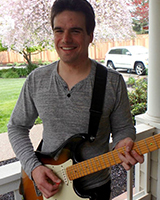 His skills allow him the breadth of knowledge to teach beginning to advanced guitar as well as the principles of music theory and composition. Mitch seeks to build an individualized curriculum of material for his students that they are enthusiastic about, but that also develops their fundamentals of musicianship. He loves to teach and see his students grow by sharing his passion for and knowledge of music. As a composer, Mitch has started and performed in music groups for over ten years, one of which won UCSB’s Battle of the Bands in 2015. Currently he is performing in a jazz combo that can be found gigging around the Bay Area. He has performed in University jazz bands for over 4 years, and played at legendary venues around California such as The Fillmore and DNA Lounge.